Reclaimed wood is appealing for many reasons. 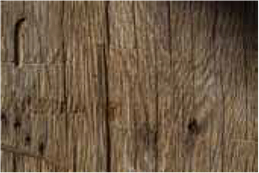 Reclaimed wood offers a unique, one of a kind appearance. Utilizing reclaimed wood in designs contributes to not only the beauty of the design, but also contributes to sustainable building. Reclaimed wood is often more stable and presents a more durable option than many modern lumbers. Because reclaimed wood is sourced from older structures, the lumber was sourced before air pollution and were most likely harvested and processed by hand. Reclaimed wood is what is know as old growth lumber, meaning that it is from trees that were able to slow grow in dense forest before settlers arrived and began competing for land use. Reclaimed wood offers stability, as it has been exposed to changes in heat and humidity for years. New lumber can often shrink or expand as it is exposed to different elements, creating changes in the final product.